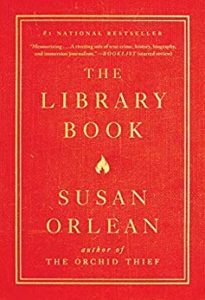 While Orlean’s book is structurally about the LA Public Library, she also continually draws parallels with other libraries in the country and the world. You get a sense of how libraries developed and thrived over the last 140 years or so. You will cheer the librarians on for their visions, as they transform libraries from book-loaning spaces to integral and central parts of the communities they serve. At the beginning of each chapter, she lists four books and their call numbers which relate to the content in the chapter. This is a fun resource ... it not only gives you a preview of the chapter, but it also may entice you to go pick another book off the shelf. Like this, from Chapter 7, The Art of Condolence: What to Write, What to Say, What to Do at a Time of Loss (1991) by Leonard M. Zunin, 177.9 Z95. This for a chapter in which she quotes some of the condolence letters sent to the LA Library from other libraries after the huge fire…. So, why three hearts instead of four? This was another sandwich book for me. I love the beginning and the end; the relevance and the knowledge I gained. However, in the middle, she spends longs pages – too long for me – on the history of the Los Angeles Public Library and its challenges, leadership, funding issues. I became a bit bored with the LA-focus. In sum, yes, I recommend this interesting book, with my only hesitation being the lengthy history section. Finally, I want to share this tidbit, from page 93. “In Senegal. The polite expression for saying someone died is to say his or her library has burned.” Provocative, yes? Nancy Pearl, librarian, critic, commentator, and author, is credited with inventing the Rule of 50, plus it's addendum. The rule states that if there are no firecrackers by page 50, put the book down. The addendum is that for every year you are over 50, subtract one page. So for me, as of a few weeks ago, I can now stop at 35 pages. I made it to 42. 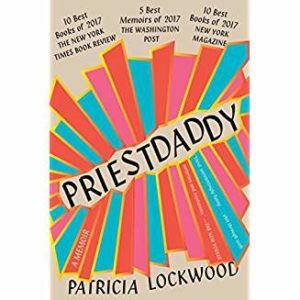 I found every single sentence in Priestdaddy to be overwritten. Like this (page 38): “Great mermaids flowed through the streets: southerners.” And this, page 25, “He had the small, neat, unjudgmental ears of a teddy bear.” Huh? Unjudgmental ears? Then I read the reviews on the back that declare this book to be hilarious and I knew my fatal flaw had kicked in. I had not even smiled once, much less laughed. So, my apologies to my friend who recommended this book, and who shall remain nameless so as not to sully her fine reputation (I love you still, friend C). And I am moving on. I was charmed by this book. Yes, as some reviewers point out, it is a techie's dream book, at the intersection of books, extreme technology, and knowledge. And more than that, it is simply a delightful story. Clay Jannon takes a job working graveyard shift at Mr.Penumbra’s 24-hour bookstore, where only a few books are ever sold. What really happens occurs in the tall vertical stacks in the back, where assorted characters drop off obscure books and pick up others, that Clay wraps in brown paper. These books are not sold; they are simply exchanged. For a while, Clay obeys the rules and never looks inside these books. Clay’s job, besides climbing the ladder to find the requested book, is to record in the log who took the book, what they were wearing that night, their emotional state, how they smelled, and their words. Of course, one day Clay looks inside and discovers symbols ... not text at all. And with the help of a Googler, Kat, and various designers, techies, and artists, he begins to discover and unravel the secrets of the Unbroken Spine, a centuries old movement(? ), sect (? ), cult(?). 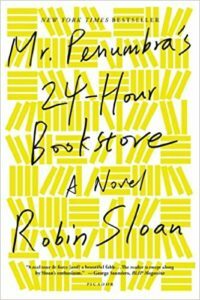 Mr. Penumbra's 24-Hour Bookstore is a fable and a fantasy, imbued with amazing real technology, a delightful read, and just plain fun. This is just a bit of a reluctant four hearts, but still closer to 4 than 3! Benjamin Benjamin has just trained as a caregiver, and begins working with Trevor, a young man with Muscular Dystrophy. No surprise, their relationship is challenging, but a strong bond does grow. There are two interwoven story lines. This first is the tale of Ben and Trev. Eventually they embark on a road trip, which is where the fun and adventure really begins! Interspersed with this plot is Ben’s back story, and how he lost his wife and two children. At first, I was frustrated at not knowing the back story before I knew the present-day story but then I realized that was the intent of the author, to weave the two tales simultaneously. The Revised Fundamentals of Caregiving is interesting, more of a light read than a heavy read, though there are relationship challenges that will leave you sad. I am not quite sure why I am giving this a “reluctant” four hearts. There is something about Evison’s style that didn’t land with me, and I don’t know what it is. 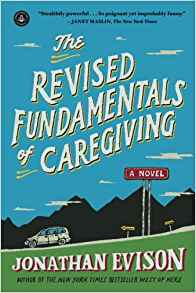 But overall, yes, I recommend The Revised Fundamentals of Caregiving, and will be pleased to hear what you all think of it. This is a book club read, so I will enjoy hearing what the Casting Crew has to say! I loved this book! It is King at his best non-horror writing. I learned quite a bit about the Kennedy assassination and the days and months leading up to it. He must have done significant research to create this tale. It is a book for which occasionally you will grab your phone and Google a historical figure or place, to learn more about context. 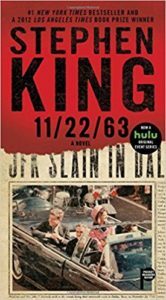 Be warned, 11/22/63 is LONG. My copy was 1031 pages. The paperbark is 849. As with all long books, there were a few pages in the middle where I began to tire, but I knew that was more about me than the writing. I definitely recommend 11/22/63. Ah, I breathe a sigh of relief after the last James Patterson I read (see my review on Suzanne’s Diary for Nicholas) This is James Patterson back at his best. 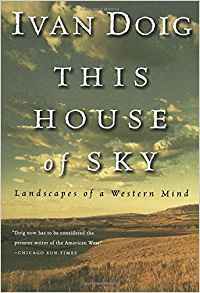 Just enough complexity and intrigue; a page turner near the end; relationships that have soul and heart; a vivid plot; a noticeable number of strong women characters; the stark reality that may come from having an ex-President as your co-author. The President is Missing (wishful thinking?) is about a potential crisis of epic proportions. It takes great creativity to imagine this crisis ... clever and scary, beyond a doubt. And President Jon Duncan is the only person who can prevent the crisis. Hold your breath! My only criticism is slight ... I believe the book is mis-titled. It gives the impression that the President has been kidnapped and cannot be located. That is not the story line. The plot is richer and more interesting than a kidnapping. I might have titled it Dark Ages. 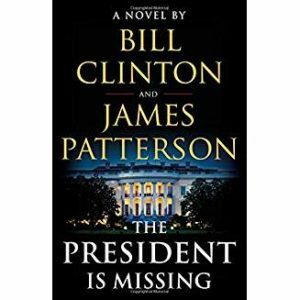 Let us know what your title is, after you read The President is Missing, which I DO recommend! The Naturalist Notebook: from a week on the Noatak River. I discovered this book at the National Park Service visitor center in Bettles, Alaska. Kristin Link, the author, created a watercolor journal of her time in the Brooks Range. This is a beautiful book, very inspiring. The only way to buy this book is to track down her website, which I did. A Life in Hand: Creating the Illuminated Journal by Hannah Hinchman has some great exercises to get you started, and to free up your voice. She also has a good section on supplies. How to Keep a Naturalist's Notebook by Susan Leigh Tomlinson is a pretty book, with some good ideas, but for my taste, an over-emphasis on drawing. 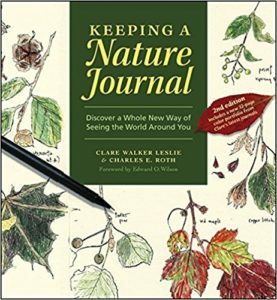 Keeping a Nature Journal: Discover a Whole New Way of Seeing the World Around You is, for my purposes, the cream of the crop. This lovely book expands beyond nature drawing and brings in much of what I was personally looking for … ideas on how to use your journal, to slow down, as a spiritual practice, how to see and be present with the world around you, in the natural world and not. They have chapters on seasonal journaling as well as information about journaling with kids, varying your layouts, different ideas for keeping your journal fresh and new. And it is a gorgeous book, with many black & white and color journal examples. If you buy only one book, this is the one to purchase. I bought all four of these books, so if you would like to borrow any, just let me know. I was with my college friends Janet and Mark in August. Together, we visited Isle Royale and Voyageur‘s National Parks. But perhaps the best times were playing pinochle in the evenings ... ah, reminiscent of Ann Arbor evenings. But I digress from my intentions. While we were traveling together, Janet and Mark recommended that I try on some Spencer Quinn novels, his Chet and Bernie mysteries. And so I did. Dog On It was a nice respite between heavier books. This is a book you can read in a few evenings. Bernie is a Private I. Chet, his sidekick, is a “K-9 Trained Dog”. The story is told from Chet's point of view. 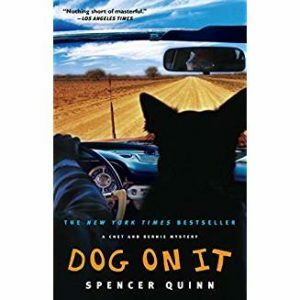 So if you don't like dogs, or never lived with a dog, leave this book on the shelf and instead search for funny cat videos on YouTube. But if you know and love dogs, you may very well appreciate Chet's perspective on humanity, and what we do, and how we smell, and what is confusing about working with us. In this novel, Chet and Bernie search for Madison, a missing 15-year-old. Anyway, as I say, if you’ve never lived with a dog that won’t be funny. It may not be funny to you if you DO. Nevertheless, Dog On It is the first of 8 Chet & Bernie books and I will read more!